A few hours at the casino could be a fun way to unwind for millions of Americans, but for scam artists it’s an opportunity to prey on the most vulnerable people. Eddie Morris was apparently an easy mark for one such scam artist. An elderly retiree, scarred in a childhood accident, he was befriended by a stranger then swindled out of his cash. “I’m an easy going guy,” Morris said. He’s a regular at the Players Casino in Ventura. That’s where he met a scam artist who likely spotted Morris first. “They’re looking for usually the elderly people,” said Derek Boss, a security expert who works with Las Vegas casinos. Part of his job is catching cheats or advantage players stealing from the business but increasingly also spends time protecting the guests playing at the casinos, he said. Boss said scammers working as distract-and-grab teams, targeting elderly players to steal chips or credits, but that’s an example of a quick short scam. 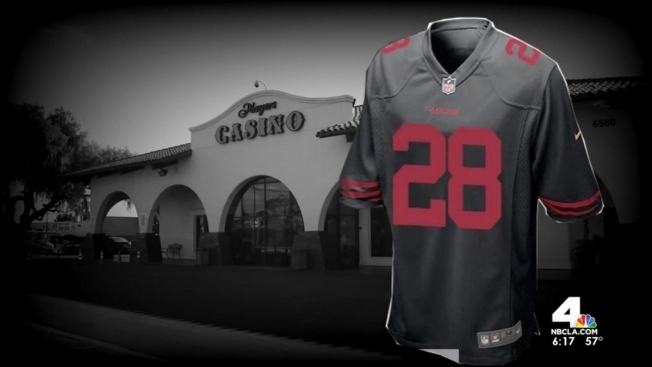 In Morris’ case, winning a 49ers jersey in a casino raffle gave a scammer a way to strike up a conversation. “He says ‘I’ll give you $60 for that jersey,” he remembered. Morris declined, but as he was leaving, the man approached again offering a trade for the jersey. He told morris he owned a carwash. “He says, ‘I’ll detail your car, I’ll knock off $60,’” Morris said. He agreed to the deal. Morris said the man picked up his car the next day and returned after four hours. “He comes back and looked nice, you know,” he said. While prices can vary, a top-flight detail job for a Bentley at a dealership was $250. Morris drives a Toyota Camry. He ended up paying the guy $1,200. Morris said he simply didn’t know what a car detail cost. Boss said that’s why scammers target elderly gamblers, hoping to isolate them and play off the knowledge they have cash. Morris said saving $60 sounded like a win. Losing $1,200 is embarrassing, he said, but being targeted for a scam is why he wants to share his story. “If he’s going to do this to older people, I don’t want him to do it to anybody else,” he said. A Players Casino manager tells NBC4 he never knew what happened to Morris because most of the contact happened outside. He said his staff is vigilant about protecting customers and that they’ll even interrupt games and question guests if it appears someone is bothering them. For more information on how to protect yourself, check out these tips.